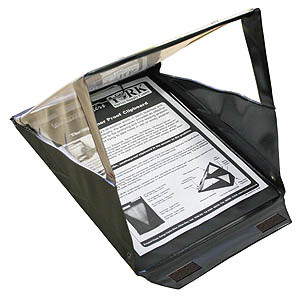 The ideal all-weather clipboard incorporating a weatherproof transparent hood keeping your all-important notes clean and dry in wet weather. Available in A4 size as landscape or portrait format and in A3 as landscape. Lightweight and compact the WeatherWriter can be carried in a briefcase. Velcro fasteners automatically releases the transparent hood which is retained in place by the same strong spring. Paper record cards plans and survey data sheets are secured by a clip operated through the hanging ring. Special pockets are provided for your pens and the nameplate card supplied.